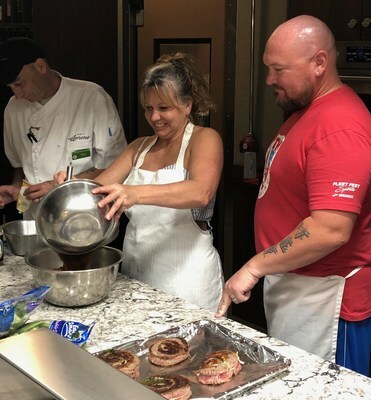 SARASOTA, Fla., Dec. 5, 2018 /PRNewswire/ -- Wounded warriors and their families crafted healthy dishes during a cooking class organized by Wounded Warrior Project® (WWP) at a grocery store. "I liked that everyone had a chance to get involved and learn something," said Army veteran Benjamin Hart. "The class was fun. People started out quiet, and toward the middle and the end everyone was talking and sharing. It was a good experience." Participants enjoyed both the social aspect of the class and the healthy cooking. They marinated chicken and flank steak, prepared side dishes, and made dessert. They, of course, got to enjoy the good food they prepared. Maintaining healthy eating habits is one of many challenges warriors face when returning to civilian life. Years of regimented physical training and a restricted diet contrast with the variety of choices they have at home. That's why WWP helps veterans and their families learn to make healthy choices as they transition to civilian life through nutrition and cooking classes. In addition, WWP gatherings offer settings that provide opportunities for injured veterans to form bonds with one another, their families, and their communities. These events help warriors remember they're not alone and that no matter what they're going through, there are people who care about them and can help. In a WWP survey (https://www.woundedwarriorproject.org/survey) of the injured warriors it serves, 80 percent of survey respondents expressed social engagement and support led to them registering with WWP.